Exepnathos ( Zippie ) is an operational K9, he is an air scenting area search dog who loves to find people, he especially loves children. He is trained to do a “Bark Alert”, so if he finds you, he will stand next to you, and bark loudly until his handler comes over to complete the find. He may lick you, sniff you, and say a quick hello before he barks, since he loves people. After his handler gets to you, his favorite thing to do is take a rope, and then he loves to be chased and play “Keep Away“. Since passing his evaluation as an operational K9, he has been busy teaching people to Hug A Tree if they get lost, he loves to take part in Preventing Search and Rescue Programs and other public education. He is also learning new search skills, so that he can be a trailing dog, and he is learning to find missing articles and other clues. If you think you’re good at hide and seek, come out to one of our K9 Unit Drills, and see if you can trick Zippie. Max, who is planning to be our next operational search dog, is roughly 2.5 years old. Max met his handler when he was about 8 months old, we don’t know too much about him before that. 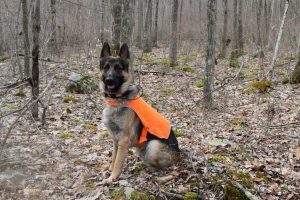 He has enjoyed the last year or so of his SAR training and has gotten to be really good friends with his handler while they have been training for SAR together, and practicing their obedience too. Max will tell you how important it is to be best friends with your handler, if you are a dog that is. All that work has paid off too. After passing his Basic SAR test this past winter, Dave and Max have been working hard, and Max recently passed both his Basic Obedience test, and his Intermediate SAR test. They are looking forward to the challenges of earning the right and privilege to be an advanced trainee team, and after that, the honor of being our next operational K9 Team. Max loves to run, and he loves to bark, really, he loves to bark a lot. Like his teammate, he has been learning to do the bark alert, and he does it quite well. Once he finds you, there is no doubt you have been found. After he finds you, his handler gives him a rope, he loves to carry it in his mouth and play chase and keep away. He always wins, four legs beat two. He would love for you to come and see him continue to learn as he works to complete the more challenging problems required to be an Advanced Trainee. We can’t wait to have Max in the field, he has earned a reputation of not only meeting, but surpassing expectations. Come and help us keep an eye on Max, he may be selling ear plugs as a side job. 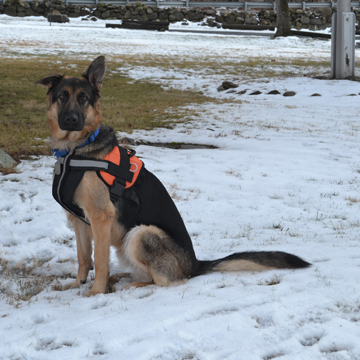 Dakota is New Jersey Search and Rescue’s newest K9 member. He has been training for a while and is now proud to say he is officially a K9 Trainee. 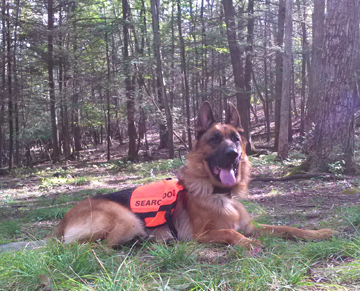 He recently passed his basic obedience test, having passed his basic SAR test several months ago. Since passing his basic SAR test, he has been working hard and expects to pass his intermediate SAR test as soon as he gets a better grip on a few skills he will need throughout his career as a SAR dog. Like his K9 teammates, he is training to do a “Bark” Alert. Dakota likes to meet people, and he likes to lick faces. Once he finds you, he will bark and try to get you to play, he loves to play chase after you give him the toy. He will drop it on the ground and dare you to take it, then he will grab it out from under you, and run off. Dakota believes in fair trade and has been known to run off with your hat if it happens to fall off your head when you are playing with him. He does not consider that to be stealing though, since he does trade you his toy for your hat. Dakota is a happy puppy with a fun personality, if you would like to come out and hide for him or his teammates, we would love to have you.